Chevettes. I could see the road below me through the holes in the floorboards in ours. By the time my brother headed for Atlanta in it, that lime green beauty was held together with bumper stickers and resin. Now, when I see a compact car, I tend to call it a Chevette, like I might use the terms Kleenex or Band Aid. Ahh the mighty Chevette. My dad had a gray one many moons ago. Drove the hell out of it. I still see a few out here from time to time, their lives spared due to an abundance of decent mechanics and an absence of salted winter roads. i left flint in1986 for oakland ca. car of choice for the x-country adventure? you got it, kirby's blue chevette. i am eternally grateful to that little car! My sister had one that was a strange mint green color. I would venture to say there is not a single person from Flint in their 30's or older, who hasn't owned or operated a chevette at least once in their life. Ours was sort of red, sort of purple. Ah yes, the Chevette. In its day it was a good car and cheap to drive. 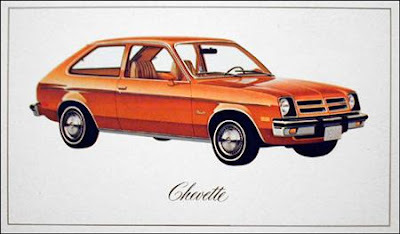 My wife and I bought our first new car in the spring of 1979--a '79 Chevette with four-on-the-floor. It was a real pretty brown with those tri-color stripes on the sides. It cost us $3650 with a sticker price of $4100, at Summerfield Chevrolet after they moved out on Clio Rd. That still remains the best deal I ever had on a new car: I drove it 2-1/2 years and got $3000 as a trade in! You know, they are now collectable! Especially so for the Isuzu diesel ones built after 1981 or 1982. I considered buying one, but they wouldn't get out of their own way--zero to 60 in...two months! I see them still driving around Flint here every week or so. I drove a chevette in high school. It was that 70's brown with yellow/orange stripes or somesuch look. To this day, I remember driving on I69, windows open (no A/C), listening to AM radio (no FM). My 79 Chevette was the last car I had with roll down windows. Back in 1982, after 3 years of driving, 2 of the window rollers fell off in my hand while in use. The only car I ever owned that this happened on. When I complained that I had never seen so much plastic used in a car (up to that date in time), the write up man at the Chevey Dealership said "please sir down't call it plastic. GM sends us customer relations manuals (no e-mail back then)saying we are to refer to it as space-age materials." I feel the current death of GM was'nt sudden. The ateries were already clogging up in 1979 and 1980 with my purchases of the Chevette followed by a Citation. Gordie, I usually read this blog on an RSS, so I miss a lot of of the comments and some of the memorabilia. When I bought my "Firethorn" red Chevette with manual transmission, I didn't even know how to drive a stick. I loved that car even though it had a checkered history. Someone shot out the driver's side window when it was parked in front of my apartment on Third St. A cab driver dented the same door when he pulled out of the drive. I got Vet's cab to pay for the repair. Someone tried to rip out the antenna when the car was parked in front of my parents' house. It was a fun car to drive, but I didn'thave it long enough to experience the rusted floorboards. It did, however, have a strange leak in the winter. Water would pool on the floor under my feet and then freeze. I don't remember the heater being bad. I sold it to finance my move back to SF in 1981. 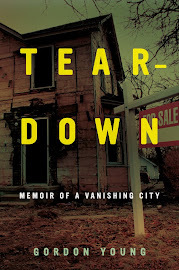 Ah, the golden years--when The City was a cheap place to live! May 13th. 2010. I Live in Flushing MI. and own 3 Chevettes, I drive to and from work, a total of 240 miles a week, 5 days a week to Burton and spend 23$ a week for gas at 2.98 a gallon. I will defend the Chevette because it is what We use to be...Tough and difficult to appreciate.